Matthew Metzger’s paintings address themselves directly to the history of abstraction, but they’re also astonishing and accurate representations of the discarded objects of everyday life. They are about both the lives of things and their renewed vigor on the flat surface of a painting. The opening of his new exhibition at DOVA Temporary, “The Interrogative Remainder,” brought up a number of questions about Metzger’s process, motivations and the importance of 1970s arena rock. For the most part, your paintings are fanatically illusionistic, reproducing the surfaces and two-dimensional forms of various ordinary objects and ephemera with great skill. And yet you are not interested in the painting “passing” for the object itself. I am tempted to describe your realism as entropic—always undoing its own illusion or betraying its artifice. Can you talk about your paintings’ relationship to the real, to the thing itself? Before the photograph, illusion was part of painting’s vocabulary, spatial illusion that is. After the photograph became common currency and after texts like [Clement] Greenberg’s “Modernist Painting,” spatial illusion lost its potency. But currently I see illusion having a revitalized voice regarding paintings “medium specificity,” but the illusion I am speaking of is one of surface. A surface is always and already flat. When you render an object’s surface in paint, something really tricky happens. The two surfaces—that of the object and the painting—collide in what I hope to be an endless oscillation in how one encounters the “real.” Naturally, in order for this oscillation to occur a viewer has to be conscious of the illusion at work. Therefore, the “break-down” is necessary. Through this collapse, the painting is exposed without any more mystery, re-inscribing the deceit and negotiations of what’s “real” that is at play in the viewers’ own psychological manifestations. 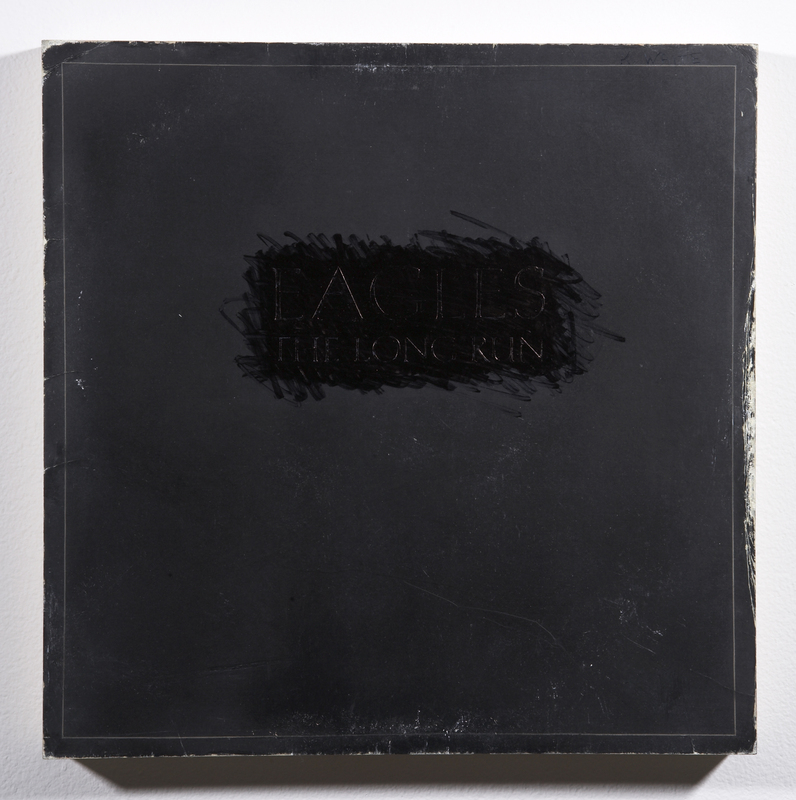 Let’s take an example like “Other Criteria,” a painting of the Eagles record cover for the album “The Long Run.” The title has been blacked out with a Sharpie marker. Can you explain how you get from your encounter with the used object to the almost completely black square we see in the gallery? When I saw the Eagles cover in the thrift store all I could see was the exhaustion of monochrome painting. Its edges were as worn through as the framework of abstract painting. At the time, I was thinking a lot about [Leo] Steinberg’s essay “Other Criteria” as well as the cover of that book, and I felt that “The Long Run” album cover harnessed a stunning resemblance to both. So I began to concern myself with conflating the act of aggressively marking out the text (of the title) with the “reflection” perpetuated by that gesture. The effect of the Sharpie on the painting produces a literal reflection of light which at one angle renders the text illegible and at another legible, a highlighting through erasing. I see it as an effacement of one author in order to make permanent the mark of another. You have said that you grew up loving abstract painting and that part of your project as an artist was to figure out how to make abstract paintings now, how to be relevant without being ironic. Can you talk about your continued faith in abstraction as a representational strategy? I am primarily interested in fundamental philosophical problems of seeing, experiencing, understanding and trying to issue some specificity to such vague terms as reality, truth, or faith. Abstraction, when employed as just another convention of art making, offers painting a contemporary language for elucidation on broader subjects such as phenomenology, culture, linguistics, identity and the trace (particularly in Derrida’s use of the word), etc. What is the meaning of your exhibition’s title, “The Interrogative Remainder”? 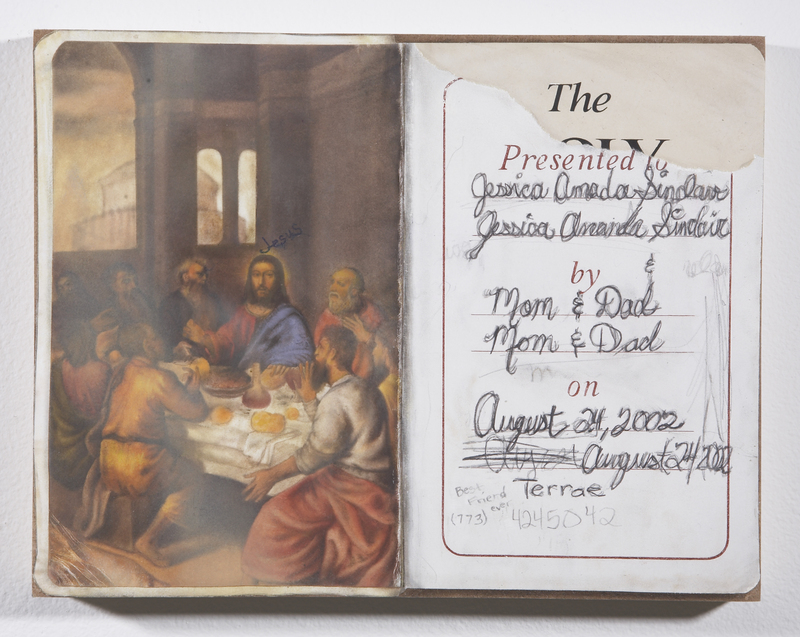 I think all the paintings in the show depict objects that are cultural remainders in one way or another. They are discarded objects that no longer contain their original use value. Somewhat displaced. Yet I find each object to provoke questions about both abstraction and the abstract illusions we construct for ourselves about who we are. I see my painting “National Geographic” as illustrative of the frame that so much of our vision is haphazardly filtered through. The yellow border operates as a lens, speaking to the politics of National Geographic’s highly problematic means of aestheticization through photographic representation. 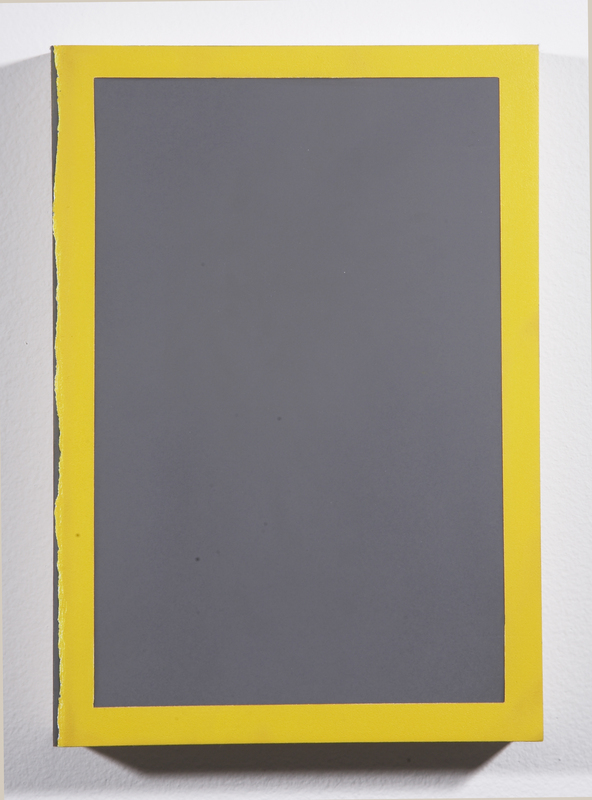 The painted ground of the painting mimics an 18% photo grey card used to calculate tonal evenness in photography. You have mentioned the importance of Michael Fried’s discussion of “shape as form.” What does that mean to you in the context of this exhibition? It allows me to see one dominant convention of painting (the rectangle) in extreme tension with the objects that are represented on the surface in paint. That is why the panels are made to the exact maximum size of the objects painted. Frank Stella used paint as a means of submitting to the frame, as a recitation of the support structure in the early sixties. I want to use it more to antagonize the painting as a separate substance. I prefer to amp up the tension between paint as a separate material from the rectangular support that hangs on a wall. Paint as a surface that exists independently, always shifting, always rolling over itself to dismantle the perceptions and thoughts of its viewers. 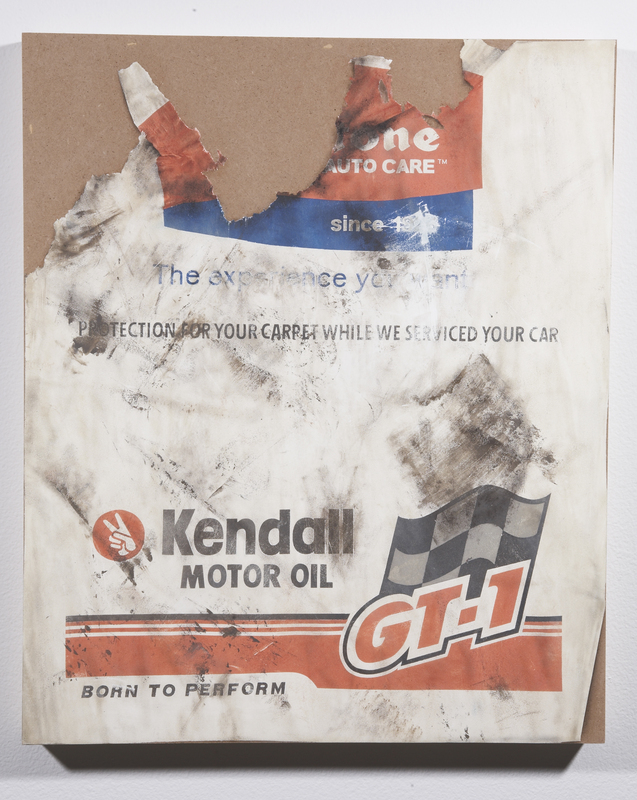 Matthew Metzger, “The Interrogative Remainder,” shows through March 27 at DOVA Temporary, 5228 South Harper.